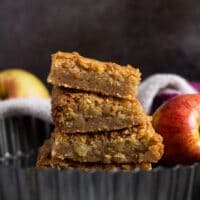 Apple Cinnamon Blondies – These cinnamon-spiced blondies are incredibly thick and chewy with a lovely crinkly top, and stuffed full of juicy apple chunks! 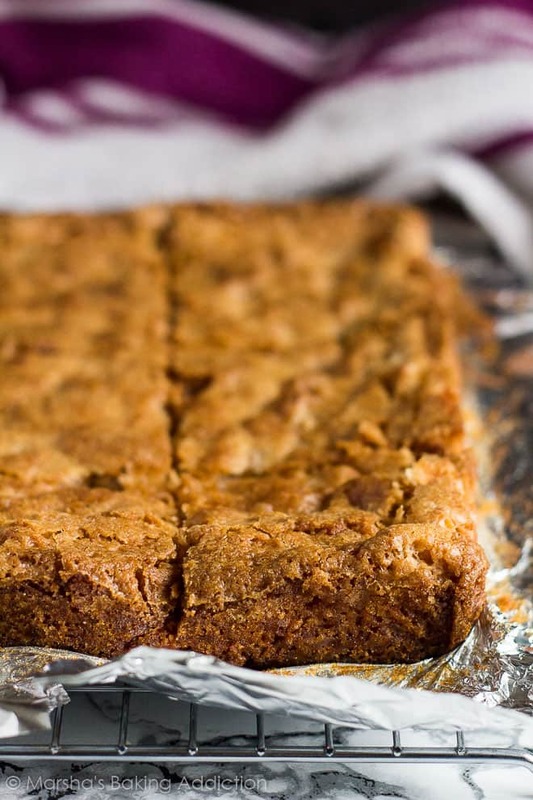 These cinnamon-spiced blondies are so incredibly thick and deliciously chewy, and they have that beautiful paper-thin crinkly top. 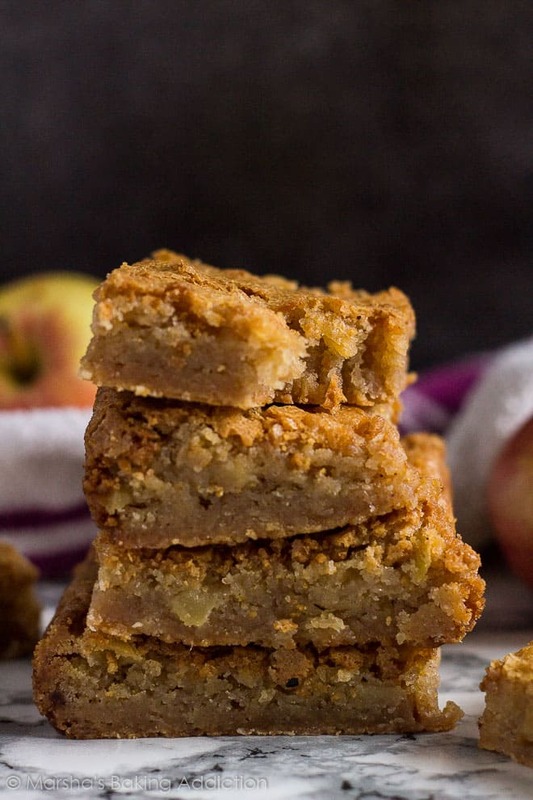 These are loaded with scrumptiously juicy apple chunks, making these the perfect blondies to enjoy this autumn with a nice, hot cup of tea or coffee. What I love about this blondie base recipe, is that it is a one-bowl recipe. All the ingredients are combined in one bowl, with only a whisk or spatula – no mixer required! The apples are also so easy to prepare. All you need is 2 apples, peeled, cored, and chopped into small chunks. 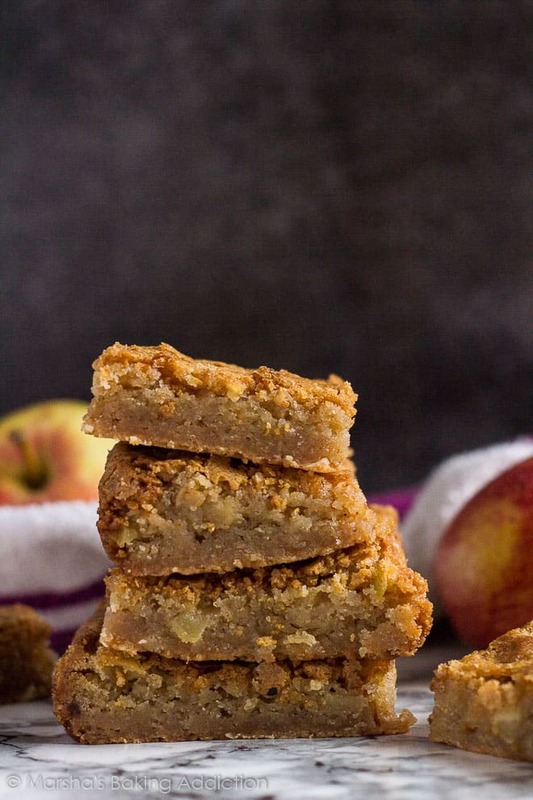 Simply fold the juicy apple chunks into the blondie batter. Simple (and delicious)! Try these delicious blondies next! 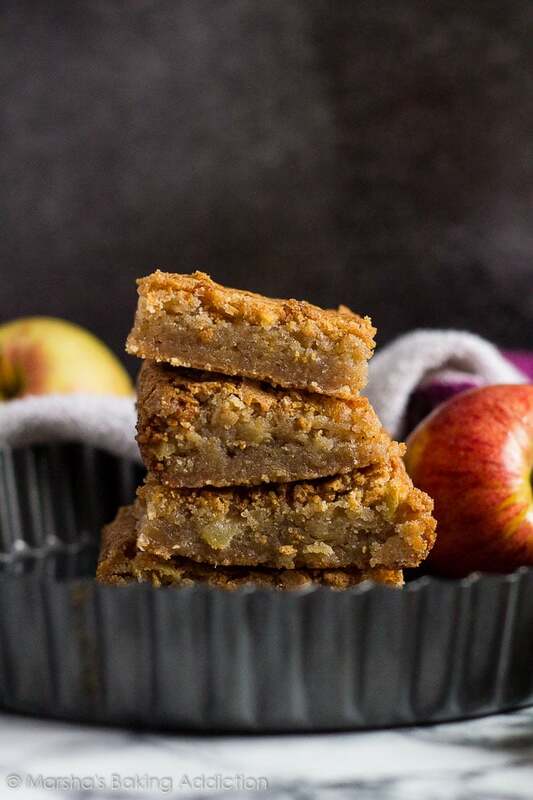 These cinnamon-spiced blondies are incredibly thick and chewy with a lovely crinkly top, and stuffed full of juicy apple chunks! Preheat the oven to 180C/350F/Gas 4. Line an 8x8-inch square baking pan with aluminium foil or parchment paper and spray with baking spray. Set aside. Whisk together the butter and sugars until smooth and combined. Add the egg, egg yolk, vanilla, and salt, and whisk vigorously until smooth and combined. Fold in the flour, and spices until completely combined, then fold in the apples. Spread the batter evenly into the prepared pan, and bake for about 25 - 30 minutes, or until the centre is no longer jiggly and a toothpick inserted comes out clean. Do not over-bake. Allow to cool completely in the pan on a wire rack before cutting into squares. I like to leave mine in the fridge for 1 - 2 hours before slicing, as they are more firm and I get cleaner, neater cuts. 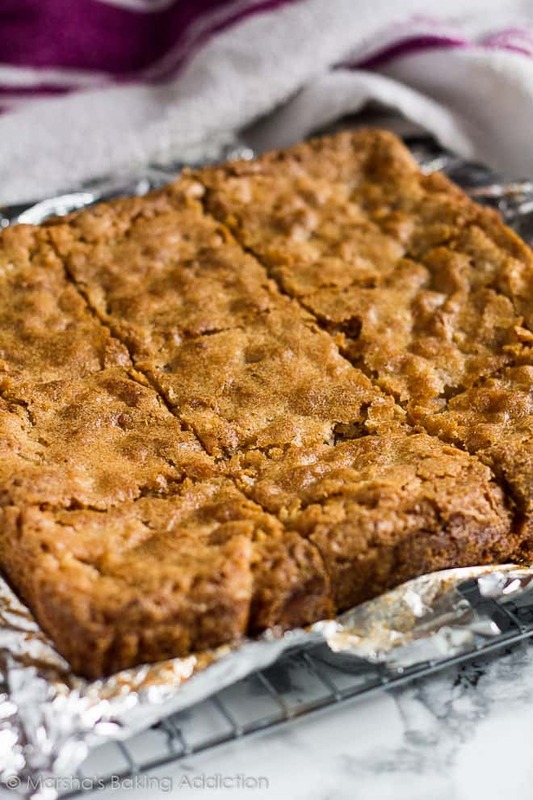 Blondies can be stored in an airtight container at room temperature or in the fridge for up to 3 days. They also freeze well for up to 3 months. Thaw overnight before serving. Ohhh that looks totally delicious! I love anything with apples, and I think I might even try them with bigger chunks of apple. Do you think that would work? Anyways, I’m pinning this for later! This looks Yummy Marsha. Thanks for sharing such a lovely recipe. I am drooling over these blondies! They sound incredible! The insides of these look like ooey gooey perfection! I’ll take that whole stack! Yum!!! These sound perfect for Fall!! 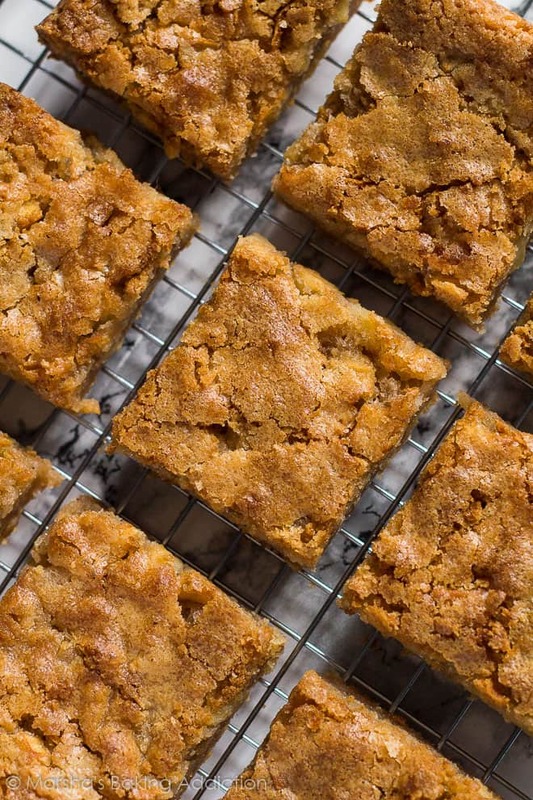 These look like the ultimate autumn blondie, Marsha!!! I love the apple cinnamon combo going on here! I could seriously eat the entire tray of these! Cheers! I’m so glad you enjoyed them, Sam! Hi Marsha, i m about to make this for the second time in a week, they were splendid! They re probably even better straight out of the fridge. I didnt have nutmeg or ginger but they were great with yust cinnamon ! I will get some though cause they ll definitely spice up the flavor! I was wondering if i can double the recipe and use a 9×13 baking pan. Thank you very much for sharing! Looking for a blondie recipe my friend’s mom made. I have searched the website and have not located. The last step was to swirl the almost melted chocolate chips into the blondie batter and complete the baking cycle. Hope I have gone to the right source, love your website. Merry Christmas.